This ASOS playsuit was on my wishlist for MONTHS, I tell you, until it got reduced far enough for me to take the plunge at last. I'm sceptical about playsuits because they're pretty impractical and the onesie never seems to work for me as I'm a fair bit taller than most people. I went for the 24 in this, and it fits perfectly! I've worn it a few times now, and it's held it's shape well. The construction on this is pretty good overall, it's a nice material, well tailored and comfortable to wear - a bit of a rarity for a high street buy nowadays. The black is sadly now out of stock but the green version is still on super duper sale here. Yesterday was BOILING, and I spent pretty much all of it running errands, packing and not sitting in the sunshine drinking cider as I would have vastly preferred. This time next week, I'll be a London resident! Right now, I'd like to say I'm excited, but I'm mainly stressed and exhausted and wishing this week was over already. I'm fairly certain that this dress might have been the stuff of my teenage self's wildest dreams (polka dots, PINK and TULLE), so when I saw it at the last clothes swap I ran with the Yorkshire Rad Fat Collective I decided to try it out. I like swapping for that, it often makes me pick up things I wouldn't in a shop, and try them out. Both the dress and the cardigan are from the swap actually - I normally hate cropped cardigans but after finding this realised that they make a lot of sense because they don't overpower a dress like a full length one. Opinion = firmly changed. Anyway, I got a bit fancy to go eat Thai food with my partner - the first of a few food stops we're making around Leeds before heading down to London, spending a last evening eating some of my favourite things. Dress and cardigan, £free from the clothes swap! 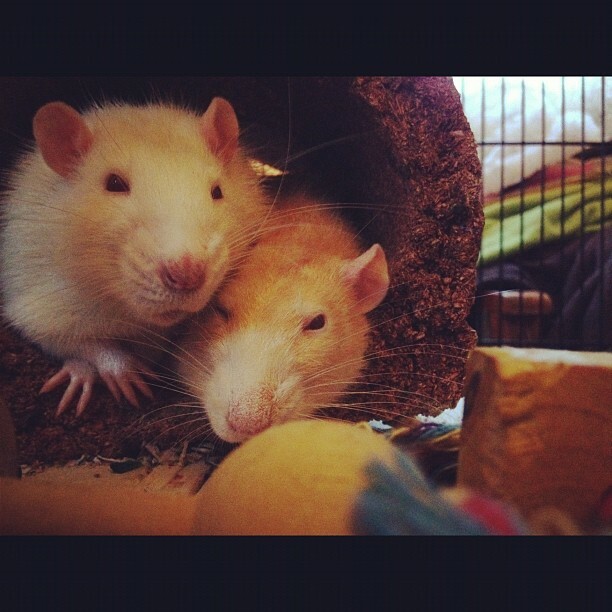 Also editing to add a picture of my rats being the cutest things ever, because lots of you wanted to see more of them, and also because they are total babes! Time for another somewhat haphazard Polyvore post! There are loads of seriously amazing and fierce pieces floating around online at the minute, so I thought I'd share my favourites with you! You can probably tell, but this season I'm really into looking a bit tougher but still with a femme edge. I already own a couple of these pieces (the bandeau, docs, a similar leather jacket and the blue skirt), so you'll be seeing them in outfit posts soon enough, and the others are on my wishlist for the time being.